For a while now a good friend of mine, Chris had wanted to come out for a walk and a camp. We worked together and often found it difficult to align our days off, especially as Chris has a young family. A career change for me meant that we could better plan and managed to get a few blocks of days off at the same time. After some careful planning we set on a date, the 23rd January 2017. We both loved Dartmoor as its on our doorstep and it seemed the most logical place to head. As Dartmoor is used for military training, we checked the range times (https://www.gov.uk/government/publications/dartmoor-firing-programme), planned a route and we were all set. I had recently found that a lot of hikers, including many on Dartmoor filmed their walks, camps and adventures and uploaded them on to YouTube. I enjoyed watching these videos, not only for entertainment but some of them were educational and introduced me to the world of lightweight and ultra lightweight backpacking. This, unknown to me at the time would become a massive part of the next twelve months for me. In any case, I picked up a GoPro Hero 4 Silver in the sale, found the camera mount for my Pacer Poles and was ready to film the walk. I picked Chris up from his house mid morning and we drove to Brat Tor car park (SX 524 853) arriving around 1200. We made sure we had everything and then headed down the path towards a the river Lyd where we used the stepping stones to cross. It was a warm day, unusual for the time of year and we were not the only ones feeling it. As we approached the ford a group of Dartmoor Ponies had just come down from Arms Tor for a drink. After the Ponies had moved on, Chris and I made our way up between Brat Tor and Arms Tor. Midway up we turned towards Arms Tor and carried on up. The ground was typical of Dartmoor, part bog, part rocky scatter and part solid ground. When we reached the top of Arms Tor, it was around 1300, with only a few hours of light left so we decided to head to Great Links Tor and look for a spot to camp. I knew there was access to water slightly lower down which we could collect after pitching camp. When we reached Great Links Tor, we had a bite to eat and a cuppa whilst taking in the views and looking for somewhere to pitch. To our surprise, even though the air temp was around 13 Celsius, there were large areas of the ground covered in thick ice. We could not find anywhere decent to pitch so decided to head down toward the River Lyd near Great Nodden were we found a nice flat non boggy and unfrozen area to pitch camp. 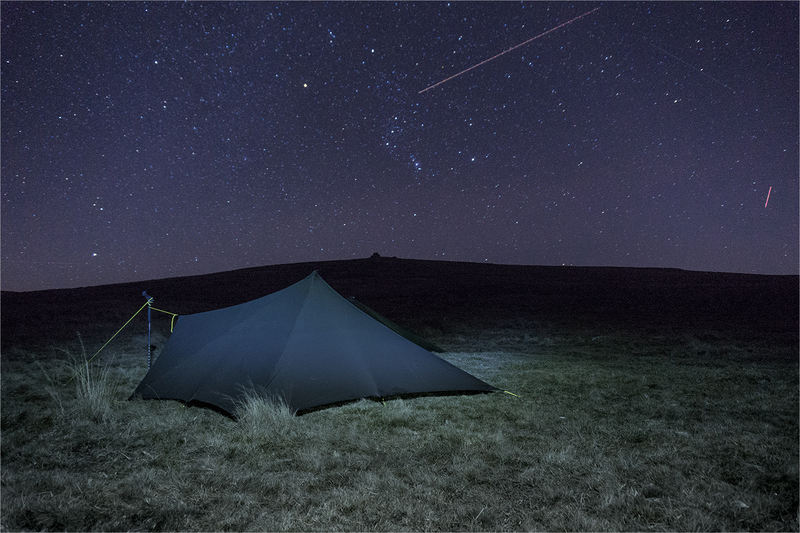 I took my MLD Trailstar with me and Chris was using a 3×3 tarp that he’d had for many years. Once we’d pitched, it was time to collect some water from the nearby river Lyd, get the stoves out and make a coffee before taking in the stunning sunset. As night fell, so did the temperature. We saw lows of -2 Celsius but both stayed nice and warm. This picture was shot using my Sony A5000 with the standard 16-50 kit lens using my head torch to fill in some light. The three light lines were not shooting stars, they were aircraft moving overhead. The next morning after a few coffee’s and some much needed breakfast we headed back up to Great Links Tor, passing Little Links Tor on route. The weather had changed quite allot with the wind picking up and temperatures sitting around 5 Celsius, with a wind chill of -1. From Great Links, we headed back to Arms Tor and then onward to Brat Tor where we had a coffee, took some pictures and then headed back to the car. Although we didn’t walk very far at all, it was great fun. It was good to get Chris out, great to have such good weather and its always good to be out in the fresh air. As I mentioned above, I filmed this walk and camp and the video of the trip is on YouTube, you can view it below.